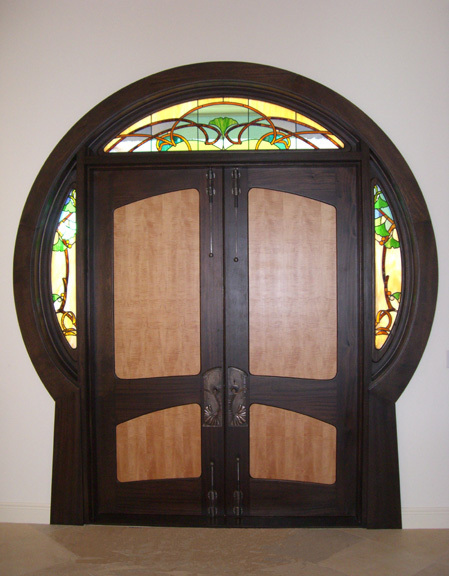 This door was inspired by an executed work by the Belgian Art Nouveau designer/builder Hector Guimard. 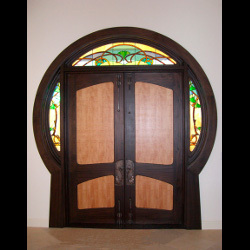 His architectural door featured a round frame that challenged our imagination, and served as the foundation for this design. We incorporated stained glass sidelights from award-winning glass designer Susan Pratt-Smith, a New Hampshire native who is an active participant in our design team. Our door is double-sided - solid sapele frame with curly maple panels on one side, and solid sapele frame with sapele panels on the other side. The Florida architect for this house had to structurally reinforce their standard tropical styrofoam and gesso wall construction to anchor and accommodate this massive, class 6 hurricane-proof door. It will probably outlast the house. Another very unique feature of this door is the outstanding gingko leaf-inspired lockset, that I designed and had executed by another professional associate, the blacksmith and metal designer Ralph Sproul. We had searched widely for appropriate hardware to fit this door, and finally committed to design and fabricate it with Ralph's expertise. This lockset can and should stand on its own in any design competition.